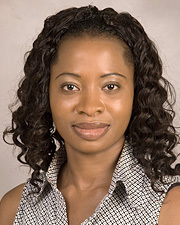 Dr. Modupe Idowu is a board certified Physician and Assistant Professor for the Department of Internal Medicine at McGovern Medical School at The University of Texas Health Science Center at Houston (UTHealth). Dr. Idowu has repeatedly earned the Dean’s Teaching Excellence Award. She also won the 2007 Henry Christian Award from the American Federation for Medical Research. In practice since 2005, Dr. Idowu treats adult patients (18 and older). Her practice philosophy centers on treating each patient with respect and care at all times. Patients appreciate the dedicated, personalized and evidence-based care they receive, as well as the fact that they feel welcomed and respected. A resident of Pearland, Dr. Idowu is married and the mother of three children. Her favorite leisure activity is spending time with her family. For people living with sickle cell disease, chronic pain becomes an all too familiar part of everyday life. The UT Physicians Comprehensive Sickle Cell Center is working to help change that. UT Physicians has expanded the Sickle Cell Center to accommodate the growing number of patients. Subspecialists, social services and behavioral health services have all been added to the center for a holistic approach to patient care.